Americans work a lot. In fact, full-time U.S. employees report working an average of 47 hours per week, which is about an hour and a half more than they reported a decade ago. Research also found that nearly four in 10 full-time employees report logging 50+ hours a week. Crazy hours at the office often lead to busy, overly stressed employees who don’t have time to care for their health and wellness. These employees are susceptible to workplace burnout. Burnout in the workplace not only has detrimental effects on employees but damaging effects on the company itself. Even more shocking is the high-cost employers pay for employee burnout. According to Harvard Business Review, the psychological and physical problems of burned-out employees cost an estimated $125 billion to $190 billion a year in healthcare spending in the U.S.
It’s important for employers to understand that employee burnout is more than just workplace stress. So, what exactly is burnout? According to Mayo Clinic, job burnout is a special type of stress. It’s a state of physical, emotional, or mental exhaustion combined with doubts about the competence and the value of one’s work. While stress and burnout are a bit different, stress is still a strong contributor of burnout. Most employees are usually under a lot of stress for a period of time before becoming burnt out. To put it simply, stress is often short-term, while burnout takes place over an extended period of time. This means that factors such as too much workplace stress, long hours, and overwhelming projects can lead to burnout. Talk about stress. Addressing stress is crucial in promoting a stable workforce. Add stress education to your existing wellness program. Use this education to teach employees effective stress management techniques and coping skills. Consider bringing in healthcare professionals to guide “lunch and learn” sessions regarding stress. Offer flexibility. A flexible workplace limits the chances of employee burnout. Flexible hours, schedules, and the ability to work from home eliminate a lot of the challenges that full-time employees (especially working parents) struggle with. As an added benefit, studies have shown that flexibility in the workplace often leads to more productive, loyal, and happier employees. Encourage time off. Time off from work is crucial for employees’ mental health and wellbeing. Employers should encourage employees to take a step away from their work when they need a break. This includes encouraging employees to take regular breaks from their desk throughout the workday, supporting employees who use their PTO and vacation days, and promoting mental health days. Check in. Always keep open communication with employees. Ask them how they are doing on a regular basis, and check to see if they are stressed. Ask them if they have any concerns about their workload and if there is anything you can do to help. Discuss realistic workloads, deadlines, and overall expectations. Employers should strive to stay open-minded and receptive to employee feedback. Cross-train employees. Depending on your company, it might be beneficial to cross-train a few employees on the same team. This way, tasks can be shared when an employee is overwhelmed or needs to take a day off. Cross-training employees can help reduce stress when colleagues can work together and fill-in for one another. Prioritize wellness. Promoting employee wellness will help reduce burnout levels by keeping employees physically and mentally healthy. Provide nutritious snacks, host a walking club, and start off important meetings with some breathing techniques. Don’t let job pressures affect the health of your employees. Learn how to spot signs of employee burnout and take action to help prevent burnout from spreading. Remember that crazy hours, overwhelming deadlines, and strict schedules will only harm work performance. 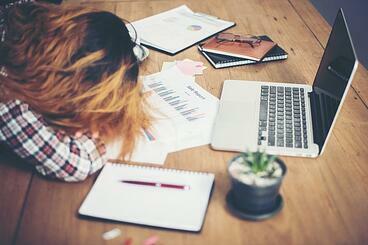 How do you prevent employee burnout at your workplace? Comment below! Like this blog post? Share it with your employees or colleagues with this printable version of the blog!